We covered Griffin Technology’s HELO Helicopter over the holidays at the end of 2011. We had a few different iPad controlled helicopters buzzing around the office. Bouncing into the walls as well as each other. The Griffin Tech HELO was a lot of fun as it was very nimble. Last week, we found that Griffin Technology started shipping their new version of the HELO Helicopter, the HELO TC Assault . 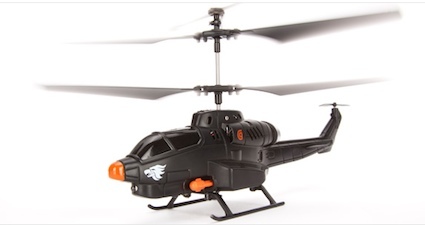 As the name implies, the helicopter comes with little missiles that shoot from the helicopter as it flies. Flight is controlled with the iPad with either on-screen controls or via tipping the iPad. A small bit of hardware is included with the HELO that plugs into the iPads headphone jack. A couple items we have learned; the control is IR and not wireless so the HELO has to be in sight of the iPad (some of the folks in the office managed to fly around corners if there was a painted wall to bounce the signal off of) and make sure you have headphone volume out limiters turned off. Like the original HELO, the new HELO TC Assault can have three of it’s flights recorded and replayed on the iPad. It’s a handy feature if no one believes you completed a flight between cubes and through rooms.